It was a spring morning in 1965, several weeks before the start of the Rolling Stones’ third North American tour, when Keith Richards rolled out of bed and noticed something strange. The Philips cassette player that he kept in his London bedroom appeared to be broken. He’d put a new tape into the machine one day earlier, but now the cassette was at the end of its spool, having somehow wound its way through 45 minutes of useable tape. Curious, he rewound the cassette and pushed play. A three-note guitar riff came blasting out of the speakers, followed by some basic chords and a simple refrain. “I can’t get no satisfaction,” went the melody, sung by Richards in a sleepy, half-conscious voice. After several repetitions, the music faded out and gave way to 40 minutes of snoring. Richards had apparently woken up with a melody in his head, recorded it with his acoustic guitar and then fallen back asleep. Who knows what sort of sordid, oddball stuff Keith Richards dreams about? Some things are better left unsaid. Whatever the subject matter, something made Richards angry enough to clamber out of bed and scream his satisfaction into a tape recorder. Out of that frustration arose the Rolling Stones’ biggest single to date, not to mention one of the most enduring rock songs of all time. Like most Rolling Stones classics, “(I Can’t Get No) Satisfaction” was a team effort, with Mick Jagger adding his own contributions on May 6, 1965. The Stones were supposed to be playing a show in Clearwater, Florida, but their fans had rioted after the first four songs and the concert was cut short. To prevent further chaos, the musicians were told to go back to the Jack Tar Harrison Hotel and stay put. Frustrated, Jagger headed down to the outdoor pool and fleshed out the lyrics that Richards had already started. Ten years later, the Church of Scientology would buy the Jack Tar Harrison Hotel and start hosting religious retreats by that very same pool. There was nothing holy about Jagger’s lyrics, though, which attacked the modern world – its commercialism, its obsession with consumer culture, its inability to excite a 22 year-old man who’d grown tired of the status quo – with fierce, sexual language. The “tryin’ to make some girl” line was the most risqué part, at least according to the producers of Shindig!, who censored the Stones’ on-air performance of “Satisfaction” later that year by cutting out the entire line and splicing the remaining halves together. What the producers failed to notice was the reason Jagger couldn’t “make some girl,” which was actually a slang-filled reference to menstruation. “Baby, better come back later this week,” the girl explains to Jagger, “‘cause you see, I’m on a losing streak.” That line stayed in, presumably bringing a blush to the cheek of any female who understood Jagger’s lingo. This was raunchy stuff, especially for 1965, but that didn’t stop “(I Can’t Get No) Satisfaction” from becoming the Rolling Stones’ first number one hit in America. Oddly enough, Keith Richards hadn’t planned on releasing the song, at least not the version we all know. The guys recorded it twice – first at Chess Studios on May 10, then again at RCA Hollywood Studios on May 12 – but neither version included horns. Richards always assumed a horn section would play the song’s signature riff, even going so far as to use a Gibson Fuzz Box at RCA Studios to mimic the sounds of a saxophone. It was supposed to be a placeholder part, a scratch track, but the Fuzz Box gave the song a frantic, buzzing energy that everyone else seemed to prefer. Despite Richards’ objections, the guitar riff remained, the song was released less than four weeks after it was recorded, and horns stayed out of “(I Can’t Get No) Satisfaction” until Otis Redding recorded his own version later that year. Even in their early 20s, the Rolling Stones showed impeccable taste in music, and “Satisfaction” was a melting pot of their wide-ranging influences. The guitar riff modeled itself after the horn arrangement from Martha & the Vandellas’ “Nowhere to Run” – had Richards succeeded in adding brass to the song, it would’ve sounded even more similar – and the lyrics took a page from Chuck Berry’s “30 Days” (sample lyric: “If I don’t get no satisfaction from a judge”) and Muddy Waters’ “I Be’s Troubled” (“I’m never bein’ satisfied, and I just can’t keep from cryin’”). The Rolling Stones started off as a cover band, after all, and their own compositions showed off the band’s roots, from Motown to blues to seedy rock and roll. 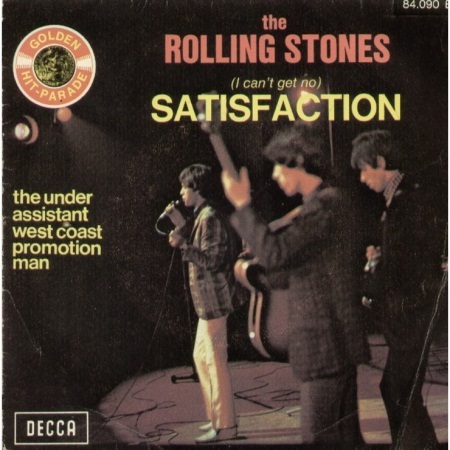 “(I Can’t Get No) Satisfaction” has enjoyed a near-infinite shelf life, immortalized by decades of radio airplay and generations of aspiring guitarists who tackle the single-string riff after learning the intro to “Smoke On The Water.” Other artists have taken their own stab at the song, from Otis Redding’s brassy rendition to Britney Spears’ ill-fated cover. Tom Waits even incoporated its lyrical theme on “Satisfied,” a song from his latest album. But there’s something about the original version that can’t seem to be replicated.